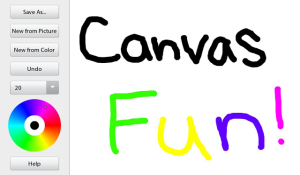 Quickly and easily draw, doodle, and annotate on a ANY picture on your BlackBerry PlayBook device or on a solid color background of your choice with Canvas Fun! Draw with any color, and a variety of thicknesses/weights. Choose from a solid color background any color OR a picture stored on your device! UNDO function allows you to step all the way back to the beginning of your drawing! Save/Export/Open features allow you to continue work at another time. The trial will last forever and never expire, but does have a few restrictions. Sweet app for the successful people who want to make your connection comfortable and confirmed.